For online marketers who are trying to catch customers’ attention, time is of the essence. The average online consumer’s attention span is just eight seconds. You can leverage this “get in and get out” tendency of your consumers by offering up a limited offer. Limited offers put either a time or number restraint on a competition, motivating your audience to enter before they miss their chance. With ShortStack’s new Limited Entry Feature, it’s easy to set an entry limit on any promotion that you run. 1. Pick a high-value prize: When you’re relying on your fans to act quickly, you want to make sure your prize is worth their effort. We always recommend offering a prize that’s relevant to your brand versus something that’s just expensive, like an iPhone or tablet. 2. Get something additional from your fans: One thing we love about today’s example is how the accomplish two feats with one Campaign — they get companies to register as software vendors with their site, and they drive engagement by offering free credit points with their company. The 100 vendors who claim their prize will become a valuable target audience for them to keep marketing to. 3. Set a realistic entry limit: It’s great to have big goals, but you’ll want to make sure to set your limit entry to a number that can be reached within the time-frame you’ve set for your Campaign. If your average Campaign gets 30 entries, then set your limit to 5-10. If your fans know there isn’t a real sense of urgency they may not enter. 4. Provide something to those who miss the deadline: No one likes to lose a competition, and if you have the means to provide a little something extra to those who don’t enter your promotion in time you’ll most likely turn them into a more loyal customer. These prizes don’t need to be large. If you’re offering a 30% discount to the first 100 entrants, you can provide those who didn’t make it in time with a 5% discount. 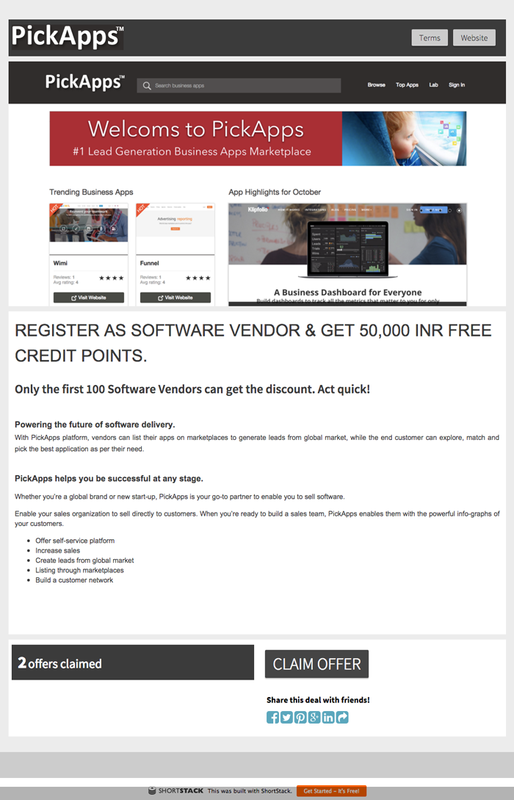 PickApps is a lead-generation platform for business apps. In a recent giveaway they used ShortStack’s Limited Entry Feature to provide an extra incentive to the first 100 vendors who register with their site. If you have any questions about our “Limited Entry” feature, shoot us an email to theta[at]shortstacklab[dot]com.